Some curious photos have surfaced onto the internet, again. 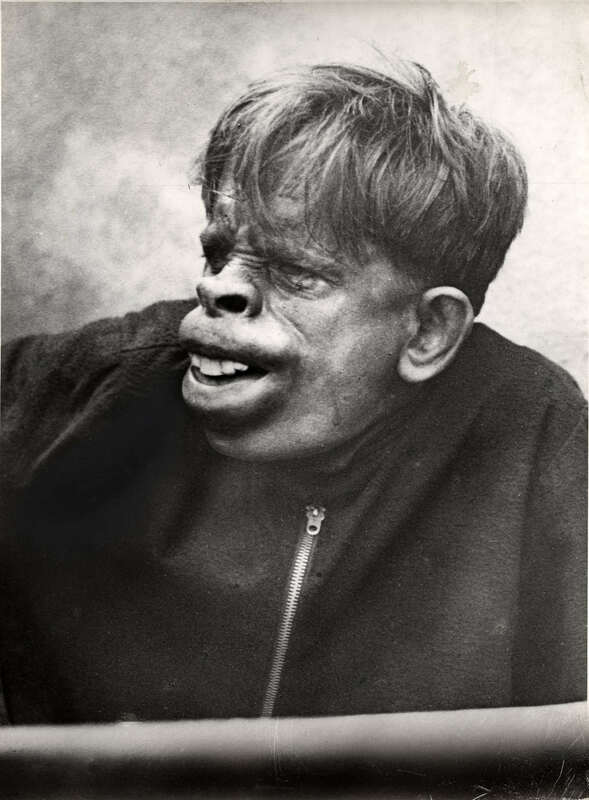 Helping make things interesting, the pictures, (supposedly) set in 1937, show a hunched man that appears to have some facial deformities. But is the photo what it seems, or is there some monkey business going on. The only story behind the pictures is that this goofy looking guy was found in the jungles of Brazil. At least I haven’t seen anything else stating what may have happened after these photos were taken. Now of course there is a lot of speculation when it comes to things like this. As we know, now a days many amazing things can be done with photoshop, and other editing tools so it’s not surprising that many people have denounced these pictures as fakes. In the close up here it has been pointed out that starting at the bridge of the nose it is possible to spot a line which could be the joining marks for prosthetic makeup. Another remark I have seen explains how the messy hair in the front, covering the forehead, is a common trick for hiding prosthetic makeup lines. I personally can’t see the line mentioned around the bridge of the nose, but something I did notice is the position of the mouth in every photo, it’s the same. I also noticed in the close-up a strange line on the inner lower lip that kind of looks like the edge of a rubber prosthetic. Some other comments I have read on the pictures of the “Apeman” have discussed how, especially back in these times, it was nothing to grab a mentally handicapped person and dress them up to act insanely while under the guise of something strange, adding to the reality of the situation. 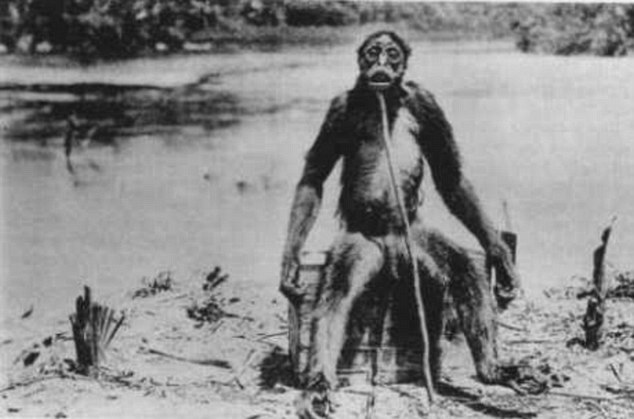 Hoax or not, these photos remind me of when I learned of De Loy’s Ape. Francois De Loys was a Swiss oil prospector who led an expedition along the border between Colombia and Venezuela from 1917 to 1920. While camping along the Terra River, the expedition was disturbed by two larger monkeys standing a little over 5 feet tall. After a sudden outburst of howls and gestures from the monkeys, one of them was shot and killed. Believing that this could be a new species/or the missing link, De Loy took a picture of the creature and saved its hide and skull. However both of the hide and skull were lost on the trip home, only leaving the infamous picture. But that picture too was met with outpours of disbelieve as know one could tell just how big the crate the monkey is sitting on, and no real sizable comparison to anything in the background. So what can you make of these stories? Granted the possibility of them both being true isn’t out the window, but…… Well it’s fun to believe they might be. Further, its fun when the internet regurgitates photos like these to keep our minds curious, and wondrous of things that might have been, or still might be. This entry was posted on October 28, 2012 by David Joseph. It was filed under Strange Reports and was tagged with Apeman, Cryptozoology, hoax, Missing Link. That last photo of the propped up monkey is creepy as hell. For the time period these photos were taken, they still are believable enough to pass as real. I wonder if any of the people involved swore to the day they died that the photos were real or did any confide in a friend or loved one that they were just a hoax? I wonder the same thing, Steve. 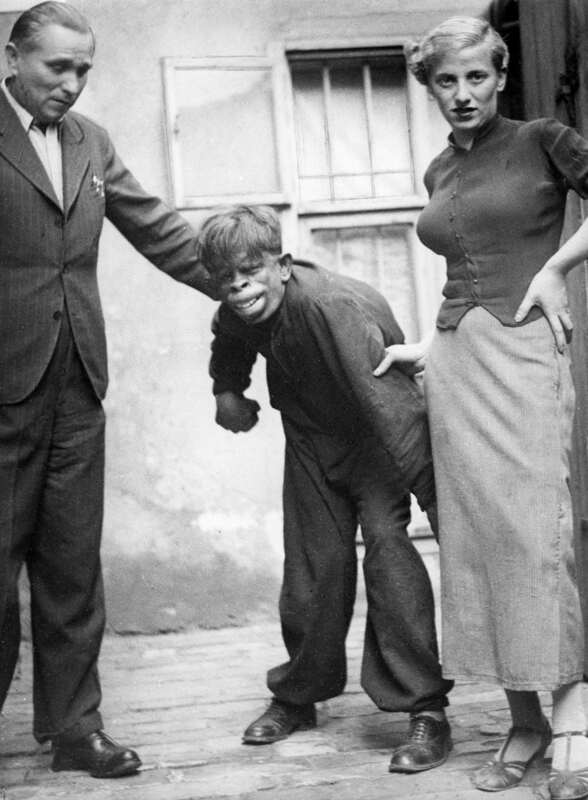 What bothered me a little while reading up on these photos was when some people were talking about how a lot of mentally handicapped people were used for silly photos, or dressed up and used for freak shows. Terrible stuff to take advantage of someone like that, espescially someone who doesn’t understand whats going on. She got some tig ol’ bitties though!